Earnest Lee Hudson (born December 17, 1945) is an American character actor. He has appeared in dozens of film and television roles throughout his career, but is perhaps best known for his roles as Winston Zeddemore in the Ghostbusters film series, Sergeant Darryl Albrecht in The Crow (1994), and Warden Leo Glynn on HBO's Oz (1997-2003). Hudson has also acted in the films Leviathan (1989), The Hand That Rocks the Cradle (1992), Airheads (1994), The Basketball Diaries (1995), Congo (1995), and Miss Congeniality (2000). He had a cameo in the remake of Ghostbusters (2016). Hudson was born in Benton Harbor, Michigan. He never knew his father. His mother, Maggie (Donald), died of tuberculosis when he was two months old. He was subsequently raised by his maternal grandmother, Arrana Donald. Hudson joined the United States Marine Corps immediately after high school, dismissed after only three months due to asthma, before he moved to Detroit, Michigan. He became the resident playwright at Concept East, the oldest black theatre company in the United States. He enrolled at Wayne State University to further develop his writing and acting skills. He established the Actors' Ensemble Theatre where he and other talented young black writers directed and appeared in their own works. Later, he enrolled and subsequently graduated from Yale School of Drama. In an interview with Belief.net, Hudson stated that he is a practicing Christian, but does not believe that "one church is the right one." One of Hudson's early films was in Penitentiary II (1982) starring Leon Isaac Kennedy. He landed various guest roles on television series such as The Dukes of Hazzard and The A-Team. He was on the television series Fantasy Island in a first-season episode as a voodoo man named Jamu. Hudson gained fame playing Winston Zeddemore, who enlists with the Ghostbusters in the feature film Ghostbusters (1984) and its 1989 sequel. He also auditioned to reprise the role for the animated series, The Real Ghostbusters, but it was given to Arsenio Hall. He had a major supporting role as the mentally challenged handyman Solomon in The Hand that Rocks the Cradle (1992). Hudson was cast as Warden Leo Glynn on HBO's series Oz. 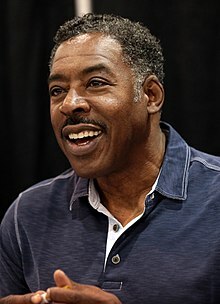 On Oz, his son Ernie Hudson Jr. co-starred with him as Muslim inmate Hamid Khan. Hudson also appears as the character Munro in Congo (1995) and as Police Sergeant Albrecht in The Crow (1994). He switched gears when he played a preacher opening the eyes of a small town prejudice in the 1950s in Stranger in the Kingdom. He is also known for his role as Harry McDonald, the FBI superior of Sandra Bullock's character in the feature film Miss Congeniality (2000). He appears in the Stargate SG-1 episode "Ethon" as Pernaux. Hudson also appeared as Reggie in the film The Basketball Diaries (1995). In 2006, he appeared in the television movie The Ron Clark Story as Principal Turner. In 2008, he began a recurring role as Dr. Fields on The Secret Life of the American Teenager. Hudson also had a recurring role on the final season of Law & Order as Lt. Anita Van Buren's boyfriend and then fiancé. In 2011, he played Stuart Owens in Torchwood: Miracle Day. Beginning in 2015, Hudson was cast in a recurring role as Jacob, an organic farmer who is the romantic interest for Frankie Bergstein (Lily Tomlin) in the series Grace and Frankie. Hudson appeared in the 2016 Ghostbusters reboot, playing Bill Jenkins, the uncle of Leslie Jones' lead character Pattie Tolan. Hudson married his first wife, Jeannie Moore, in 1963, when she was sixteen and he was eighteen. They had two sons, Ernie Hudson Jr. and Rahaman Hudson. When Ernie and Jeanie divorced in 1976, their sons moved to live with Hudson in California. Hudson remarried in 1985 to the former Linda Kingsberg; they also had two sons, Andrew and Ross. 1978 Baa Baa Black Sheep King George Episode: "A Little Bit of England"
1978 Fantasy Island Jamu Episode: "Family Reunion/VooDoo"
1979 The Incredible Hulk Lee Episode: "Like a Brother"
1980 Skag Unknown role "Pilot"
1980 Too Close for Comfort Sam Morton Episode: "The Bag Lady"
1981 Little House on the Prairie William Thomas Episode: "Chicago"
1981 Taxi Terry Carver Episode: "Of Mice and Tony"
1981 Bosom Buddies Rochelle Episode: "One for You, One for Me"
1982 The Dukes of Hazzard Avery Episode: "Dear Diary"
1983 The A-Team Cal Freeman Episode: "The Taxicab Wars"
1987 Full House Reggie "The Sandman" Martin Episode: "Knock Yourself Out"
1989 The Super Mario Bros. Super Show! Himself Episode: "Slime Busters"
1992 The Ben Stiller Show The Tennis Captain Episode: "With Bobcat Goldthwait"
1993 Tales from the Crypt Zambini Episode: "Food for Thought"
2006 Stargate SG-1 Commander Goran Pernaux Episode: "Ethon"
2008 Private Practice Captain Frank Episode: "Nothing to Talk About"
2010 Childrens Hospital Hubert McGraw Episode: "Joke Overload"
2010 Criminal Minds Lt. Al Garner Episode: "Devil's Night"
2011 Torchwood: Miracle Day Stewart Owens Episode: "The Middle Men"
2011 How I Met Your Mother Himself Episode: "The Rebound Girl"
2011 Grey's Anatomy Brad McDougall Episode: "Put Me In, Coach"
2011 White Collar Mr. Jeffries Season 3 Episode: "Dentist of Detroit"
2012 Hart of Dixie Ernie Hayes Episode: "Snowflakes & Soulmates"
2013 Dan Vs. Mr. Tadesco (voice only) episode: "Summer Camp"
2014 Scorpion Brooks Episode: "Pilot"
2014 Hot in Cleveland Ernie Hudson Episode: "Cold in Cleveland: The Christmas Episode"
2014 Comic Book Men Himself Episode: "Stashbusters"
2015 Once Upon a Time King Poseidon Episode: "Poor Unfortunate Soul"
2016 Celebrity Family Feud Himself "Hudson vs. Leakes"
2017 APB Sgt. Ned Conrad Episode: "Hard Reset"
2017 Angie Tribeca Pete Tribeca Episode: "Germs on Endearment"
2017 Lethal Weapon Agent Peterson Episode: "Funny Money"
2018 Blue Bloods Principal Darryl Ward Episode: "School of Hard Knocks"
2019 Arrow DIA General Episode: "Spartan"
^ Ernie Hudson Biography, FilmReference.com. ^ a b Ernie Hudson Biography, Yahoo! Movies. ^ "Dan Aykroyd Says His 'Ghostbusters' Sequel Will Happen". 18 February 2015. ^ Brew, Simon. "Torchwood: Miracle Day casting news". Den of Geek. ^ Hinckley, David (May 5, 2016). "Ghostbuster Ernie Hudson Enjoying Some Time With the Old Pros in Grace and Frankie". Huffington Post. Retrieved January 27, 2018. ^ Suglia, Casey (July 13, 2016). "Who Does Ernie Hudson Play In The New 'Ghostbusters'? The Original Star Has A Cameo". Romper. Retrieved January 27, 2018. ^ a b Gliatto, Tom (February 3, 1992). "Who You Gonna Call?". People Magazine. Retrieved June 13, 2018. ^ Eddy, Art. "Ernie Hudson – My Life of Dad". Life of Dad. Retrieved June 13, 2018. ^ Krug, Kurt Anthony (April 13, 2006). "Actor Ernie Hudson has fond memories of BH childhood". The Herald-Palladium. Retrieved June 13, 2018. ^ Petski, Denise (March 6, 2019). "'Arrow': Ernie Hudson To Guest Star On CW Series". Deadline. Wikimedia Commons has media related to Ernie Hudson.